We are happy to support and create this fundraising event. My name is Raymond Ramos executive director and founder of Project H.Y.P.E (helping young people evolve) a male mentoring program, retired Army National Guardsman, and an retired NYPD detective. 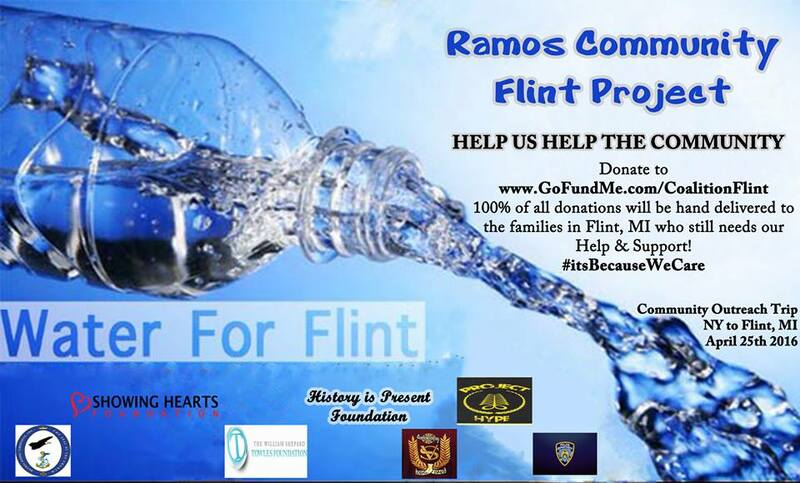 I am requesting your assistance for a very important project, the water contamination crisis in Flint, Michigan. In todays society what has taken place in Flint should not have happened. As American citizens we should not sit back as others are poisoned through such a vital necessity as water. So myself and numerous volunteers who have pledged their support are asking for your support. 100% of the funds raised will go towards purchasing water, other supplies needed and the transport of the water to the people in need. We are planning on collecting and transporting these supplies by 4/1/16. As when I served my country in 2003 in Iraq, I did so because I swore an oathe to protect and defend this country. I now have a new assignment and that is to help the people of Flint. I am thanking you in advance for your support.